Romitaman Original Comic Book Art :: Private Collection :: Menace #11 p 5 (Large Art) 1954 SOLD SOLD SOLD! 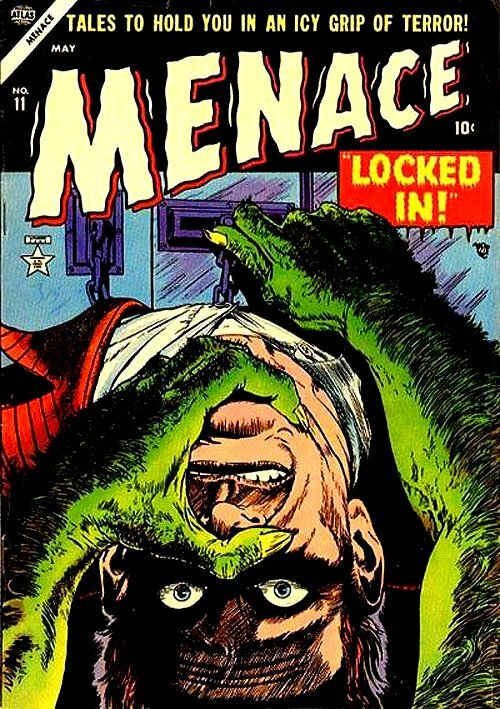 by artist John Romita Sr.
Click Here To See Menace #11 Comic Book! 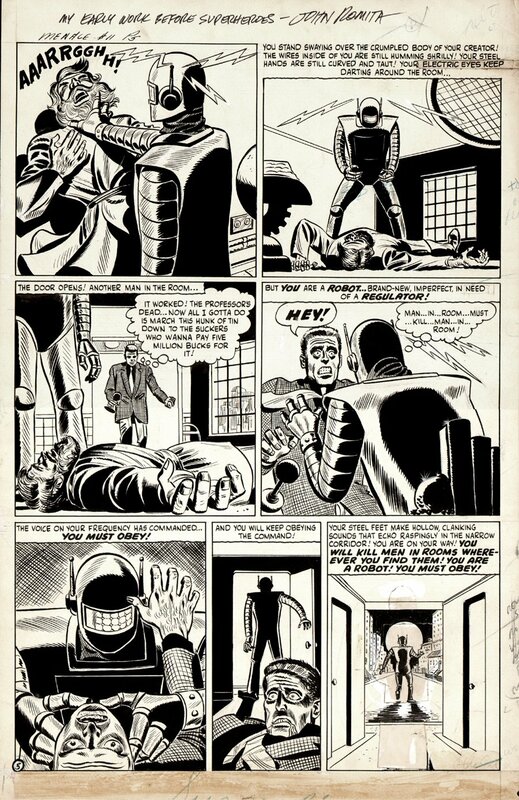 Check out this very nice, very EARLY 1954 GOLDEN Age large Art ATLAS (MARVEL) COMICS page which was penciled and inked by the great John Romita, from the classic story titled: "I, The Robot!" Very little GOLDEN AGE ATLAS art by the great John Romita is known to exist, yet here is a classic VERY early science fiction page, which was penciled and inked by the Jazzy one! In this story, a robot is given a command to kill the man in the room by someone who wishes to steal it after the robot has slain its creator. When the would-be thief enters the room, the robot slays him as well, then the robot goes out into the night looking for rooms to slay men in. This classic EARLY john Romita story has been reprinted at least 4 other times: Weird Wonder Tales #5 (August 1974) Marvel Visionaries: John Romita Sr. (Marvel, 2005) Agents of Atlas (Marvel, 2007) and Marvel Masterworks: Atlas Era: Menace (Marvel, 2009) John Romita signed this art at the top and added the extra special hand written note at the top which reads: "EARLY WORK BEFORE SUPER HEROES --- JOHN ROMITA." ALL HIGH end pieces of art, including this one, are able to be purchased with VERY fair time payment plan options, and trades are always considered towards this and "ANY" art on our website! Just send us an email to mikeburkey@aol.com and we can try to work something out.